The internet is chock full of cool new design trends for 2015. Between Pinterest, Houzz, Porch and the many interior designers who share their insights, you can find all the latest looks with a few simple searches. We did a little searching ourselves and spotted these recent trends. You’re probably thinking that wallpaper is so 1970s. Believe it or not, it’s making a comeback (as are many other things from the era). Wallpaper lets you get a look that’s difficult to achieve with paint or other materials. Bold patterns, stripes, florals, etc., can jazz up not only your walls, but ceilings too, according to designer Jillian Harris. And Houzz contributor Kurt Cyr highlights a variety of interesting uses of wallpaper, including on stair risers, inside a bookcase, to create a mural on a wall, or our personal favorite – above the fireplace mantel. 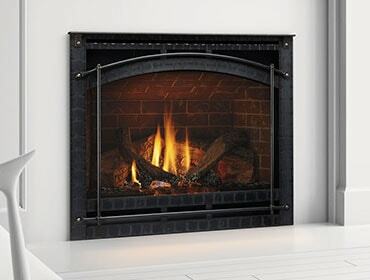 What a way to enhance the look of your Heatilator gas fireplace! Okay, this trend isn’t for you if you tend to be a little messy and disorganized – but it’s becoming more and more popular, especially in the kitchen. (Perhaps it’s an evolution from glass-front cabinets, or the influence of commercial kitchens.) Regardless, we spotted the side-less, door-less shelves on several sites across the web, including in this slide show from BHG.com. While it’s hard to literally “overlook” a ceiling, it may be one of the most overlooked interior design opportunities for homes. We’re not talking about just vaulted versus flat ceilings (and we certainly don’t advocate for popcorn-sprayed ceilings anymore) – according to several sources on the Internet like Houzz, ceiling décor is uber trendy. Paint yours a bright contrasting color to the walls, hire someone (trust us on this one!) to paste up wallpaper, add metal ceiling tiles, or have a wood ceiling installed, like this one. Metallic finishes are popping up everywhere in the Internet design community. Metals can be incorporated into your home décor through furnishings, accessories, ceiling tiles, wallpaper and paints, according to Seattle-based designer Timothy De Clue, who also advocates for mixing metals, rather than sticking to only gold or silver. Deep, rich colors have graced the walls of many modern homes the past few years. In 2015, it seems those colors are getting bolder, in both hue and use – take Pantone’s 2015 Color of the Year, Marsala, as an example. San Francisco designer Grant Gibson particularly loves bold colors, and mixing them, for 2015. He and other designers have expressed their love for deep blues this season, whereas Capella Kincheloe, a Phoenix interior designer, sees olive green trending. Whether Marsala, a deep blue or a rich olive green, we think any would complement a gas fireplace or insert from Heatilator! From all of us at Heatilator, happy decorating!